An Post (Irish pronunciation: [ən̪ˠ pˠɔsˠt̪ˠ]; English literal translation: "The Post") is the state-owned provider of postal services in Republic of Ireland. An Post provides a "universal postal service" to all parts of the country as a member of the Universal Postal Union. Services provided include, letter post, parcel service, deposit accounts, Swiftpost, an all-Ireland next-day delivery service, and EMS, the international express-mail service. 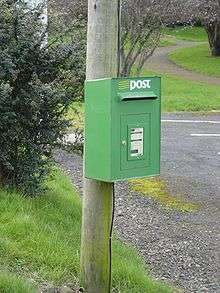 An Post, the Irish postal administration, came into being in 1984 when, under the terms of the Postal & Telecommunications Services Act of 1983, the postal services of the Department of Posts and Telegraphs (P&T) were divided between An Post and Telecom Éireann, the telecommunications operator now called Eir. At its inception, during the early years of the Irish Free State, the Department of Posts and Telegraphs was the country's largest department of state, and its employees (most of them postmen) constituted the largest sector of the civil service. Prior to this the postal service in Ireland had been under the control of the General Post Office that was established in 1660. Today An Post remains one of Ireland's largest employers but it has undergone considerable downsizing. In 2014, all parts of An Post made a profit for the first time in 8 years. There are currently approximately 1,100 An Post offices and 121 postal agents across the Republic of Ireland. The Irish government announced the introduction of a postcode system in Ireland from 2008 though An Post was against the system, saying it is unnecessary. The introduction of the postcode system took place on 13 July 2015, after almost a decade of delays. All parcel post arriving in Ireland passes through An Post's mail centre in Port Laoise, where customs officials are on duty around the clock to inspect it. An Post is involved in a number of subsidiaries. It has complete ownership of some of these, while it is part-owner of others, such as the An Post National Lottery Company and the Prize Bond Company Limited. An Post held the licence granted by the Minister for Finance to run the National Lottery through its subsidiary, An Post National Lottery Company until February 2014. All employees of An Post National Lottery Company were seconded from An Post, and as such were employed and paid by An Post rather than by the subsidiary. Since 2014, the National Lottery has been operated by Premier Lotteries Ireland, in which An Post is a stakeholder. In 2003, An Post set up a new division to run its post office and transaction services business, entitled An Post Transaction Services or PostTS. It rebranded its post offices network as "Post Office" or "Oifig an Phoist" with a new, white-and-red logo, and introduced banking services in conjunction with Allied Irish Banks. It also introduced a service whereby newsagents could provide some Post Office services, entitled PostPoint. This was thought to have reversed a downward trend in business. PostTS also expanded abroad, with operations in the UK and Spain. In 2005 PostTS sold its foreign operations. The rebranding effort was partially reversed due to criticism, with the traditional An Post logo restored to Post Offices (the red-and-white symbol has been dropped from Post Offices, but remains in use for the company's website BillPay.ie and for PostPoint). 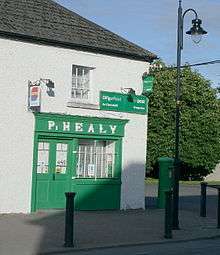 The original PostTS shop front design which featured predominantly English branding "PostOffice" with the location in English, has also been replaced with the Irish language "OifiganPhoist", with the location in both Irish and English (the PostOffice logo can still be seen, but at smaller locations is typically only on a hanging sign, not the shop front). At this time this change is complete at almost all premises. On 5 October 2006 An Post signed a final agreement for the creation of a joint venture with Fortis to provide financial services through the Post Office network. The new venture will offer a range of financial products and services to the Irish market, including daily banking, savings products, insurance, mortgages, and credit cards. PostPoint and the company's insurance business, One Direct, will become part of the new company, which will have access to the Post Office network. On 29 April 2007 a press launch was held for the new bank, which is to be known as Postbank (legally Postbank Ireland Limited, to distinguish from other similarly named operations such as Deutsche Postbank). The bank's savings and investment products include Solid Saver and Sure Investor. On 12 May 2008 Postbank launched a current account. Postbank was a 50:50 venture between An Post and BNP Paribas. They offered current accounts, savings accounts, fixed-term deposits, credit cards (Visa Inc. in association with MBNA), along with home and car insurance, and life assurance (term and over fifties). The closure of the Postbank unit was announced on 26 February 2010. No new customers were being accepted as of this date, and the operation was wound down by the end of December 2010. Some counter business for AIB can be conducted at post offices and all counter business for National Irish Bank must be as that bank has only cashless branches. Television licensing is administered by An Post. It is responsible for the collection of revenue, inspection, and prosecution in cases of non-payment of the licence on behalf of the state broadcaster, RTÉ. In 2009 An Post sponsored a national and international postcard project, called "C Both Sides". It ran for a year, with the public being invited to create postcards on different themes such as family members, sports people, older people, prisoners, migrants, and the farming community. The Commission for Communications Regulation (ComReg) launched legal proceedings against An Post over the quality of its service in February 2012. An Post said it was "puzzled" by the decision. 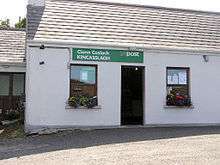 Between 1982 and 2004 the company operated a postbus route linking Ennis with parts of County Clare. Former An Post Travelling Post Office at the Downpatrick and County Down Railway. A similar TPO survives at Irish Rail's Inchicore Works. 1 2 An Post. "An Post Annual Report 2015" (PDF). Retrieved 2016-10-17. ↑ "Careers". An Post. Archived from the original on 24 November 2009. Retrieved 23 November 2009. ↑ "Dempsey announces programme to introduce postcodes in Ireland by 1st January 2008 –". Department of Communications, Energy and Natural Resources. 23 May 2005. Archived from the original on 13 April 2009. Retrieved 6 May 2009. ↑ An Post is against codes plan RTÉ. Retrieved 15 January 2007. ↑ "Postcodes". Department of Communications, Energy and Natural Resources. 2012. Retrieved 7 June 2012. ↑ Man held here in Silk Road 'dark web' probe Sunday Independent, 22 December 2013. ↑ "Fortis and An Post sign final agreement on creation of financial services joint venture in Ireland". An Post. Retrieved 24 February 2007. ↑ "Postbank to 'Wind Down' by End of Year". RTÉ News. 26 February 2010. ↑ "ComReg in legal action over An Post service". RTÉ News. 9 February 2012. Retrieved 9 February 2012. ↑ "Last stop for post bus as bosses put brakes on service". Irish Independent. Wikimedia Commons has media related to An Post.